Thinking of what to buy in Vietnam is not a serious challenge. In fact, the more huge pressure is how to stuff the items you bought into your already cramped suitcase. There are so many interesting items to buy, many of them still made by hand and at prices that are more reasonable. Of course, your shopping doesn’t have to be a deal breaker as long as you can check in an extra bag. Rows and rows of cheap bags and luggage, clothes and shoes line the streets of most cities in Vietnam. But why lug back all the stuff you can easily find in your own country? Really target on top of the line crafts and special items…buy fewer and better. Keep space for those one of a kind pieces that are exquisite and invite conversation. Start preparing for your trip by looking around your house. Are there some wall hangings that have served their time and maybe the Grateful Dead Poster, or Brother Che are now begging to be moved on to charity stores or even to the garbage bins? ​Time for a real upgrade. How about putting a splash of rainbow or the glorious country scenes on one wall? Something stunning to attract attention. Something original…because these are really affordable in Vietnam with a host of outstanding young artists. Tomorrow’s great treasures? Vietnam offers many sizzling pieces of art and crafts……. unique, age old crafts that in many countries may have already been lost or may now have price tags only Social App supported collectors would be able to afford. ﻿If you have the time and resources, you can check out the villages where people make these crafts and if you purchase one, have it signed by the artist. ​Take pictures of her working and do a collage of the purchase and your experience. ​You can join tours now conducted by Fair Trade with the purpose of meeting the people behind the products and not end up feeling guilty about unfair prices. The local tours also visit many of these villages. But, for most of you who only come here for a few days and often on your own, there are stores all over the tourist and trekker cities of Vietnam with items to make you part with your euros or dollars. Not one of those that line up the streets. There are galleries you can go to with offers for all budgets. Many of these lacquer products are thoughtfully designed, much more modern, and intricately accented with egg shells or mother-of-pearl or outrageous colours of daily life in Vietnam or of more modern artistic creations. ​You can visit some of the teachers of lacquer painting classes and check if they are selling some items which they themselves made or one of those made by their students. If you’re in Hanoi, there is a lacquer village not far from the city so you can arrange to go there. Stores like Tan My and L’Atelier Pascale have fine displays of some lacquer pieces worth bringing back. In L'Atelier Pascale, you can order something of your own design or a copy of what is there but with some changes you want to the design. Fine embroidery is so much a part of the Vietnamese tradition. I was told by a local friend that when they were in school, girls were taught how to do this. A long way from “Home Economics” in our schools in the “60’s ! We visited a village where many women do embroidery and one of them keeps a store in the centre of town so you can view many of these pieces. It’s as much a social activity as an economic effort. This Embroidery Village is just an interesting day trip from Hanoi that your hotel can easily arrange for you. There are stores selling all kinds of embroidery products such as table linen, clothes, pouches or pieces to be framed. The embroidery pieces look like paintings, just amazing how finely these were done. What I like are the bowls lined with split bamboo pieces. The colours are fabulous and for better quality, you can check out the UMA stores in Hanoi and Ho Chi Minh. The reputable ones of the crafters use glue and lacquer which make the crafts safe for food but you need to check this out. You can also use these gorgeous bowls for items that are wrapped such as candies as they are very decorative. Mostly furniture, boxes and frames, many of these pieces are just huge and too heavy so you need to ask them to ship these for you. There are, of course, smaller pieces like boxes and wall plaques which also show this intricate art work. Vietnam has many galleries where you can buy original art for prices that will not break your bank. Yes, all kinds of paintings which when rolled you can easily take with you on flights. The galleries are happy to do the rolling/tubing for you and these are easy to hand carry. Humour and colour are two wonderful features of so many works of Vietnamese artists. Vietnam is full of coffee shops where you can sample the type of coffee you might enjoy. It was here that I first tried Weasel Coffee, fruits first eaten by the weasels and eventually end up giving you the best coffee I’ve ever tasted. The Vietnamese make coffee differently so try this, too. You will be awake for a week!!!!! When you buy coffee, you'll find some tiny tin coffee makers the Vietnamese use for making coffee. They are great gifts for your friends. You can ask the store staff how to use it. It makes for an interesting conversation back home. Vietnam’s silk is quite developed and has progressed to more modern designs not just for Ao Dai. It is softer than Thai silk but equally durable especially those of quality weave. Aside from silk, Vietnam has many other traditional fabrics like linen and hemp which are now being revived and improved. 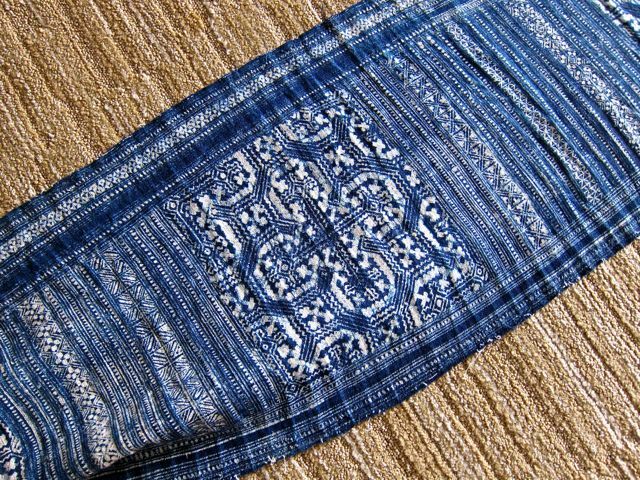 These fabrics, depending on which of the ethnic tribes make it, are dyed differently and are made of different materials like specially grown hemp. The picture above of the traditional woven hemp cloth are made by the tribes up north in Sapa and I use it as a runner for our long table at the cottage and people really admire it. The craft items I brought back with me, mostly bracelets made of cloth and beads were very popular with the younger ones in our circle. Some of them ordered more the next time I get back. 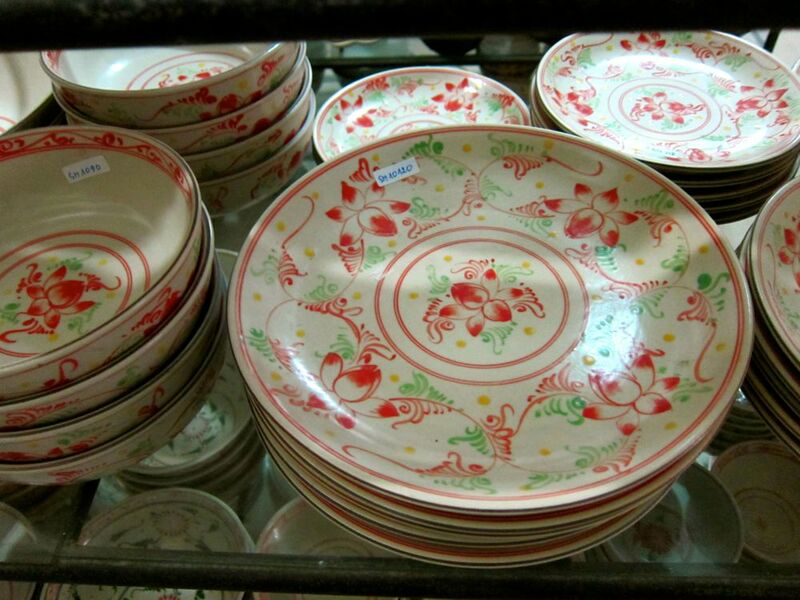 ​Go to Craftlink, a store in Van Mieu in Hanoi and they have many craft items to choose from. The prices are reasonable and you are helping many of the ethnic minorities when you buy in this place. Below is a painting on our wall that attracts the attention of many. 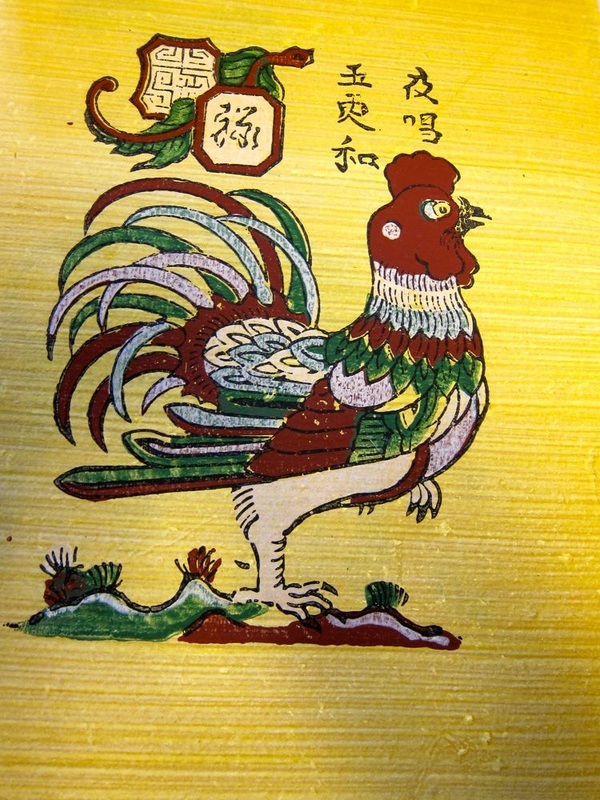 I got this from Dong Ho, the folk art painting village where a family or two still practices this. This particular one was painted by the owner himself, a former professor in The University of Fine Arts in Hanoi. Poster art was a key weapon on the part of Ho Chi Minh and the northern government both to rally their own people and to convince assorted foreigners that sticking around was a bad idea. Today, as poster art is readily available, get some as they are not only attractive but also make a great statement back home about what strength really is. Vietnam has an age-old ceramic and pottery tradition and some of the products are very rich in details especially the wall frames which tell of local life or a story. The best of these pottery is in Bat Trang. ​11. Bargains: Clothes, Bags, Shoes. “Made in Vietnam” stores dot the shopping districts of the cities so you can easily find bargains. Leather purses are now beautifully designed, no longer cheap but worth looking at. You do pay for quality. Careful with those fake brands as customs in other countries confiscate them at airports. These days, tourists are getting away from these cheap things. I suggest you visit the award winning eco-designer, Thao Vu at her studio in Kilomet 109. She fashions clothes from traditionally woven fabric. Or, view it in this video. What I enjoy buying are the cheap sunglasses so I don’t feel bad when I lose them. They can even find out your prescription from your old pair of glasses and make your prescription specs. I suggest you don't do this. Those copied specs may be far from accurate. OK…get ready…pack light…..you will bring home some beautiful memories and chat starters. What a beautiful lacquer box in red with dragonfly design. All auspicious. Just the right gift for your friends or for yourself. ​It is a stunning accent to use in some of the dark corners in your house.